My P. caudatum has been in spike for weeks now. The wait is over – the first bud is opening. I’ll be continuing to post pictures to my caudatum Flickrset – if you’re interested, check back in as the season progresses. That *has* to be your office. I wish! My office has zero windows – but the room across the hall has a mini-greenhouse area = happy plants. 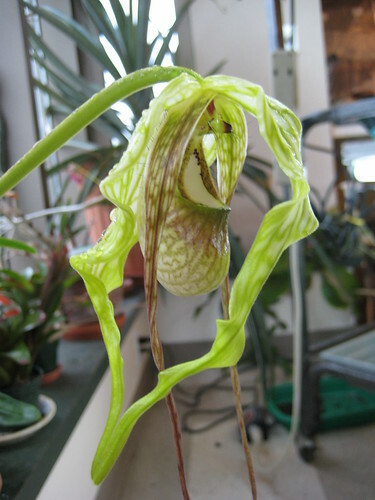 You know, if I did not absolutely *know* that Phrags are orchids – I’d swear that was a pitcher plant (Nepenthes). I believe you and all – but it just has the visual look of a Nepenthes.